HomeBlogA partnership solves the problem of at-risk homeless veterans. The Camp Salute Affordable Housing Project is a 76-unit apartment complex built with a veteran and veteran surviving spouse preference. 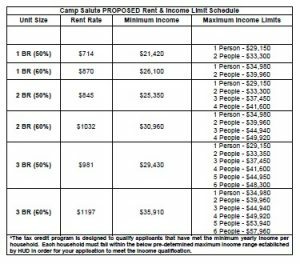 The Camp Salute apartment complex includes: five (5) apartments dedicated to homeless Veterans, 19 apartments dedicated to disabled veterans and 51 apartments, designated veteran preference. Camp Salute apartments have fully equipped kitchens, a living room and private bathroom and patio or balcony. The eight buildings offer, one, two and three bedroom apartments with the following amenities: a community room, exercise room, a computer lab as well as a tot lot playground area. Also planned is a Veteran’s Memorial area consisting of flags and a sitting area. On-site services will be provided by the non-profit partner, People for People Foundation of Gloucester County to assist on-site and off-site clients by providing workshops and support groups, addressing PTSD issues, abuse issues and access to other Veteran benefits. Federal government accredited claims agents will be on-site along with other additional veteran service organizations. Blackstock continues, “Our veterans just want a place to call their own. They feel they have earned it but find they just can’t afford it. According to the National Coalition for Homeless Veterans website, about 1.4 million veterans are considered at risk of homelessness due to several factors including: poverty, lack of support networks, dismal living conditions in overcrowded or substandard housing, an extreme shortage of affordable housing, livable income and limited access to health care and support services. In 2003, Bernadette and her husband Paul created the non-profit, People for People Foundation of Gloucester County. It is a grassroots organization dedicated to helping the normally self-sufficient who experience a temporary crisis in their lives resulting in a financial emergency or need that “Falls through the Cracks” and cannot be funded or serviced by traditional government programs or private charity sources. Within the first seven years, the Blackstocks noticed that the majority of grant applications were coming from veterans, an audience that the Blackstocks were very familiar with due to the fact that Paul’s father was a WWII Veteran who dedicated his life to volunteering for the area’s veteran population. JP Blackstock, who stormed the beaches of Normandy on D-Day was left permanently disfigured after sustaining major injuries in a later battle. JP was sent back to the states and remained in a rehabilitation facility for several years. After being released, he continued to receive support services from veteran volunteers and eventually decided that he too would dedicated the rest of his life to volunteering for other veterans throughout the region. Paul Blackstock witnessed his father’s entire recovery and the positive impact the veteran support services had on his father’s life. Also, through JP’s volunteer efforts, Paul and Bernadette saw how so many other veterans lacked access to these services. Through their efforts at the People for People Foundation, the Blackstocks saw the benefit of partnering with other organizations, both public and private. One of their partnerships with the Gloucester County Habitat for Humanity brought them in contact with Alan Connors, who at the time, was the director of the Habitat program in Gloucester County. Connors, who is a Vietnam veteran, proposed the idea of creating a housing community dedicated to veterans in need. Together, the Blackstocks and Connors spent five years looking for a site that would accommodate their vision. Along the way, they teamed up with Sam Leone, a local resident who served on the Gloucester County Chamber of Commerce with the Blackstocks. Leone is the Regional Vice President at Conifer, LLC, a nationally ranked, full-service real estate company that develops, constructs, owns and manages high-quality, affordable housing communities, located in Mt. Laurel, NJ. 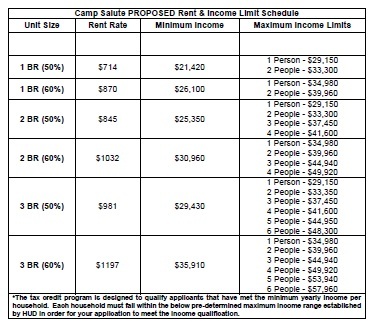 The first tenants are scheduled to move into Camp Salute on Memorial Day weekend and a ribbon cutting and open house is scheduled for the Fall. For more information about Camp Salute, visit the People for People website at: https://welcome.pfpfoundation.org/ or call: 856-579-7561. In 2010, the People for People Foundation expanded their mission to include the welfare and well-being of veterans throughout the County and State. This was prompted by a dying wish made to Bernadette Blackstock, by her father-in-law, JP Blackstock. JP Blackstock, a WWII veteran, heroically stormed the beaches of Normandy on D-Day, and was permanently disfigured in later battle. After returning to the states, Blackstock endured years of rehab and received consistent help from volunteers. Indebted to all the people who helped him, Blackstock dedicated the rest of his life after service to volunteering with veterans. This dedication to veterans inspired the Camp Salute community concept and was built in honor of Blackstock’s memory.